If you have spent any amount of time in the world of cryptocurrencies, whether that be on Twitter, Bitcoin forums or even YouTube, you surely would have heard of the exchange Binance. But why is everybody talking about it? 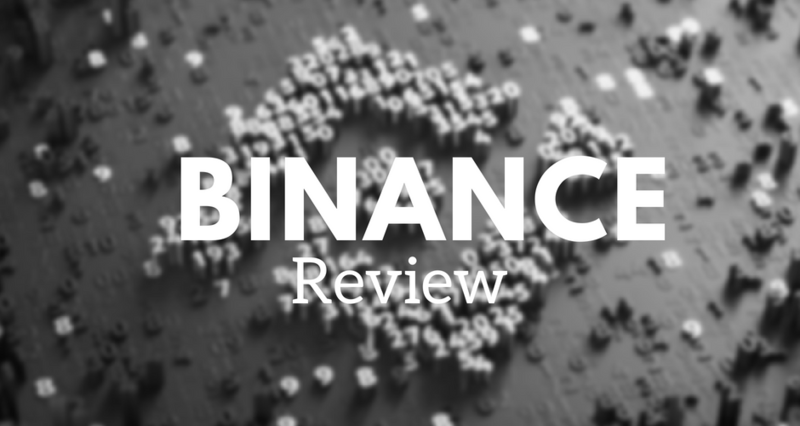 In this Binance review, we’ll go over everything you need to know about the exchange before before diving in, including how to sign up, the trading features, fees and more. Cryptocurrencies Available: Bitcoin, Ethereum, Litecoin, Binance Coin and 100+ more. Binance is a cryptocurrency exchange and trading platform that was founded in July 2017 after the company raised more than $15 Million USD during their ICO (Initial Coin Offering) for their BNB token. Although many people believe the exchange is based in China or Japan, the company has stated on many occasions that this is not true, and that they have offices in several countries around the world. The company is officially registered in the Cayman and recently released a statement announcing that they planned to move the company to Malta. Binance is headed by CEO Changpeng Zhao, a software developer that has previously worked at the cryptocurrency exchange OKCoin, blockchain.info and in 2005 founded Fusion Systems – a company that builds trading systems for brokers. Compared to other CEOs of exchanges, Changpeng has taken the unusual step of being the “face” of Binance, regularly appearing on TV talking about the exchange, doing interviews for magazines such as Forbes and Tweeting from his personal Twitter account updates, outages and news about Binance. Binance has seen unprecedented growth in it’s short existence, regularly appearing on the top charts for 24 hour volume out of all exchanges and in January 2018 exceeded $4 Billion USD in trading volume in a 24 hour period. Signing up to Binance is incredibly easy and can be done in as little as 5 minutes! *Although it’s not necessary, it’s good practice to use a unique email address for each individual exchange account. This ensures that if one of your exchange accounts was ever hacked, the hackers will not be able to access other exchanges that you are registered with using the same email address. **Always use a strong and unique password, at least 12 characters long and with lower case, caps, numbers and symbols. 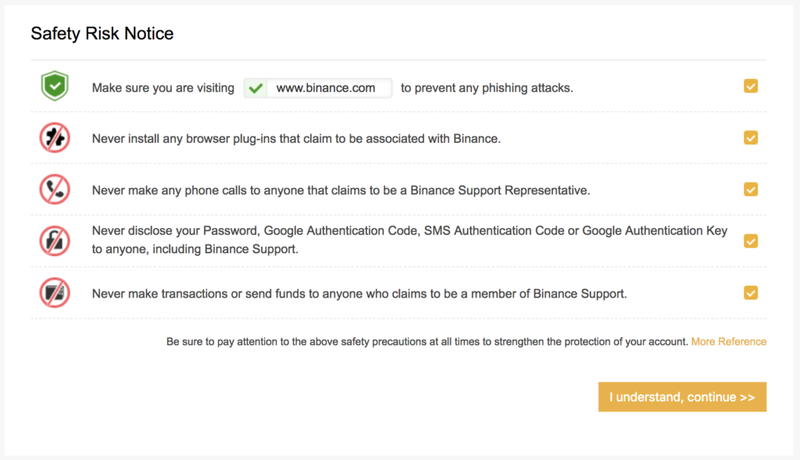 Once you’re registered, Binance will prompt you to activate Two Factor Authentication (2FA), either by SMS Authentication or Google Authentication. We recommend using Google Authentication – which is available in the App Store and Google Play. Two Factor Authentication is a system that requires you to enter a time sensitive number that appears on your mobile phone. After you enter your email address and password, the exchange will ask for your 2FA code – this ensures that only the person who has access to your mobile phone can enter the exchange. Binance offers 3 levels of verification. For majority of people who wish to trade just a small amount, they won’t need to do any verification whatsoever. Level 1: 2 BTC withdrawal limit per 24 hour period. No documents or verification required. Level 2: 100 BTC withdrawal limit per 24 hour period. Photo ID such as a passport or drivers licence are required, as well as a selfie of you holding the ID with a piece of paper with the days date and a reference to Binance written on it. This is pretty standard for exchanges to request this information. Level 3: Higher than 100 BTC. You are required to contact the exchange if you require a higher daily limit. Binance is known for their sleek trading experience. Without a doubt they’re one of the fastest and best performing crypto exchanges – they boast being able to process 1,400,000 transactions per second! The exchange offers two trading platform versions, Basic and Advanced. Even the Basic version might seem a bit overwhelming for people new to trading, but for people who’ve had experience on any of the other cryptocurrency exchanges, Binance will be able to be picked up very easily. The Basic version offers everything you’d expect: Limit Orders, Market Orders, Bid Book, Ask Book, Trade History and a basic candlestick chart. The Advanced version offers all of the Basic features, as well as the inclusion of several tools such as: trend lines, Fibonacci lines and rectangles, as addition to indicators like StochRSI, Bollinger Bands and Exponential Moving Average (EMA). Sure, it’s not quite as advanced as sites like Trading View, but the tools and indicators are a nice touch. What Coins Does The Exchange Support? At the time of writing, Binance offers 127 cryptocurrencies available to trade. The exchange adds a few new coins each month with majority of them receiving huge increases in price upon the announcement of listing. The trading fees on Binance are quite low at 0.01% and if you hold any of Binance’s coin (BNB) on the exchange, you will receive a discount of 50%, bringing it down to 0.005%. Fees for for all deposits are completely free. Withdrawal fees change regularly, depending on the coin and depending on the blockchain’s condition. If a particular coin is experiencing a lot of transactions or congestion, the fees will adjust and rise accordingly. You can find the current withdrawal fees by going to their site. Binance takes your and their security extremely seriously. From the moment you register, they make several suggestions for you to keep your account secure; it is required that you accept that you’ve read their recommend security measures before you’re able to trade. Enabling Address Withdrawal Whitelists. This ensures that if your account is compromised, the hackers will be unable to withdraw to any addresses that aren’t on the whitelist (which are your addresses). In March of 2018, several users accounts were hijacked using the aforementioned phishing method. The hackers tried to drive up the price of a coin and sell large amounts at a higher price and then transfer their Bitcoin out of the exchange. However, Binance’s automated systems detected the unusual activity within 2 minutes and halted withdrawals for the affected accounts/coins. This move saved people from losing potential thousands of dollars and Binance was praised for their quick actions. In spite of all the security measures you and Binance take, it is still recommended to withdraw your coins and tokens to an external wallet such as a hardware wallet. The cost for these are tiny (under $200) when you consider that you could be losing thousands of dollars if something was to happen to your exchange account. One of the many things that we love about Binance is that there’s a mobile trading app! A lot of crypto exchanges simply optimise their site for trading but Binance goes the whole hog and has a mobile app available for both Apple iOS and Android. Android users can simply download the app from the Google Play Store. Apple iOS user can check the App Store, although there have been reports on sites like Reddit that the app regularly appears and disappears from the app store. This is most likely due to regulations around cryptocurrencies as well as imposter and scam apps causing issues for legitimate apps in the app store. If you cannot find it in the app store, it is always available to download from the Binance website. In addition to the mobile apps, Binance also offers standalone desktop apps for both Windows and Mac users. The company describes them as being “tailor made to provide a smooth and efficient trading experience”. We haven’t found a need to use them over the website, but if you are doing a lot of day trading you may find them beneficial. Can I buy Bitcoin on Binance? No. Binance is not a fiat-exchange, which means you cannot use it to purchase Bitcoin with money (e.g. Australian dollars). Currently they on deal with cryptocurrency trading and deposits. If you wish to purchase Bitcoin to send to Binance, you can do it from this exchange here. There have been rumours that Binance will be adding fiat-entry when the company moves to Malta, although this has not been confirmed by the company. This would require Binance to partner with Maltese banks to support the transactions. Can I use PayPal or a credit card on Binance? Does Binance offer leverage trading? No, Binance is not a leverage trading platform. Is Binance a decentralised exchange? Binance is considered to be a centralised exchange, but they will be releasing a decentralised exchange in the future. We will be sure to update this once it is released. When you look at the success that Binance has had since it’s inception not too long ago, it’s easy to see why they have been so successful. The company provides its users with a hassle free trading experience, the regularly run competitions giving away cryptocurrencies and cars to thank their users and they’ve acted extremely professional in difficult time (such as the attempted hacks and in the face of tightening regulations). Overall, Binance is an outstanding cryptocurrency exchange and the future looks very bright for the company.